This week I was contacted for an interview by an upstate New York news reporter for her blog, Lara's Book Club. For fledgling authors it puts a spring in your step to have a reviewer notice your work in the midst of that great sea of volumes, volumes everywhere. Lara Greenberg's life is a cycle of reading, observing and writing about all she sees and hears. Her subject matter includes all things related to books and culture, and the cloud of topics on her Wordpress book blog reveals much of what she's written about including Harry Potter, Barnes & Noble, science fiction, Kindle, fantasy, reality TV, young adult books and more. Since The Red Scorpion was written for the YA category, is fiction with a supernatural twist, it evidently fell within the scope of Lara's radar. The interview was conducted by email, delving into the story's themes, how I came to publish the book, and why it seemed important to make it strictly available as an e-book. On this latter topic, it's noteworthy that Jeff Bezos of Amazon.com this week announced a $99 Kindle and moments later unveiled a $79 Kindle. Apparently they are aiming to stay ahead of the Nook in the electronic reading device category. But what's really exciting is two-fold. First, people are still reading books in the Internet age. Second, both companies recognize the huge potential profits in the e-book product category. If interested in reading the full interview, you'll find it here at Lara's Book Club. free will to form its own image. and illuminates it with light. 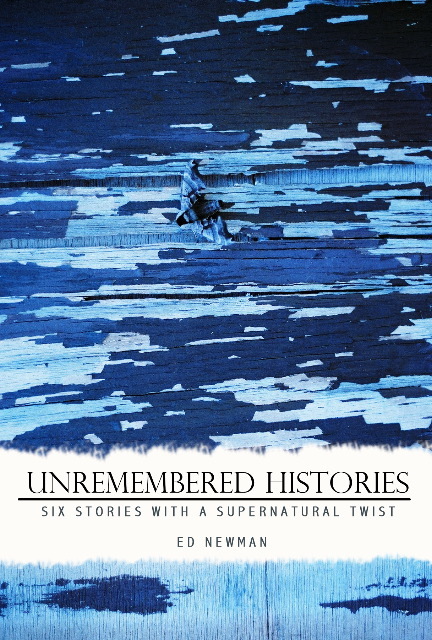 What follows is the introduction to my story Unremembered History of the World, which will soon appear in my short volume of stories titled Unremembered Histories. 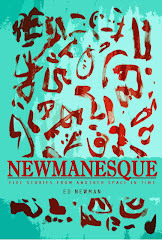 Follow on Facebook and stay attuned to this and other launches planned for fall 2011 at N&L Publishing. There are some who have proposed that it is sheer vanity for us to imagine our earth as the only heavenly body populated by creatures with intelligence and personality. I propose that it is equally vain to imagine that our history, the one recorded by our historians, the one we know as "recorded history", is the only valid history for mankind here on this earth. To imagine life on other galaxies and to search for it are not unrelated. As is well known, steps have already been undertaken to find evidence in support of this hypothesis. In regards to the notion that there exists the possibility of an infinite series of parallel times... verification of this theory is a task whose path is less self-evident, obscured as it is by mists. And yet, we see glimpses of it, reflected here and there from the great minds who were not bound to earth by the pettiness that so smothers us. Goethe noted that his heart contained the capacity for all acts, from the most heinous to the sublime. Could he have been standing on the threshold of those infinite courses that sweep into other avenues of time, unseen, unknown and unremembered? Bernard Yachtmann records instances where people have had glimpses of other histories, reiterating the conviction that time contains an infinite number of parallel streams, and in each there are alternative histories, of an infinite variety. While not every act leads to significant consequence, many acts do, and what if in an alternate history the consequences of those acts were indeed being played out. Likewise one can find similar references by Marconi, Hasjammer, and Brandt, and an exhaustive treatise along these lines by Don Luis de Nativo. In other words, to get right to my point: my proposition is not original. It has been well documented by others as a reasonable conjecture. No doubt it is my own insecurity that forces me to cite other, more significant voices, as if the testimony of my own experience will be insufficient. Those of you who know me know that I often have unusual dreams. Oftentimes the dreams unfold as detailed stories. I recently dreamt a short skit which became a television commercial. I've had prophetic dreams, including a dream which showed me that my firstborn would be a son. I've also had dreams which I believe were gifts from God. In September of 1984 I had a strange dream. As is my custom, I recorded the images of my dream, in as much detail possible, and its effect. Two months later, while looking for a book by one author or another at one of our local used bookstores, I happened upon a small, Irish green, clothbound book called Flight of Gypsies. It was one of those moments when a decision carries weight, when you feel compelled to act irrationally. The price, eight-fifty, was higher than I would have expected, especially considering the broken binding and what appeared to be several loose and missing pages. Yet when I opened the book and randomly read about five sentences, I knew that I must have the book. I'd no sooner gotten the book home than I regretted the decision. The volume was more or less a compendium of prophecies by various gypsy seers in England, from 1632 to 1785. The purpose, I could only surmise, was to assemble a record of prophetic utterances for verification purposes. For the most part, the sketchy accounts were repetitive and tedious and I soon found my self bored. There were prophecies about early deaths, unhappy marriages, deformed children, and blights on households to the third and fourth generations, utterances about flea infestations, curses of blindness and baldness, worms, contagion, and dementia. I put the book on a shelf in our garage. The next day I found one of the pages lying on the floor next to my desk. With no intention of reading, I picked it up to deposit it in the trash when the name Thomas Olney caught my eye. Olney was the name of the man in my dream. To this man and his family I will need to return, in order to strengthen my arguments and make plain my case. Not all dreams are stories, nor do all dreams reveal secrets about the nature of the universe -- though many reveal secrets about ourselves, and I am often quite impressed with the power of this magic mirror of our souls. Nevertheless, that night I began a quest, the result being this which you now read, of our unremembered history.... one of many, I might add... and one which we may all, with longing, seek to gain again.... if not for ourselves, then for our heirs. No matter how early or later, how much or how little sleep I get, it's funny how I almost always awaken one minute before my alarm goes off. Here we are starting a new week, and I'll begin by returning to an old form, the sharing of a few quotes to carry with you today. Here are some samples to start your week and for future utilization. Thank you to the new followers here at Ennyman's Territory. I'll do my best to keep providing content worth coming back forth. Meantime, make your day count. Last month when I read Joe Torre's book The Yankee Years, the great Yankee manager shared how the game of baseball had shifted approximately ten years ago. Old school managers and owners were still placing value on things like potential, whereas a maverick approach was being developed by the Oakland A's using statistical analysis to build a team. These ideas, tested in Oakland in 2002, were quickly adopted by teams that lacked the deep pockets of the Steinbrenners and other money-laden teams. Ultimately it enabled the Boston Red Sox to sling off the Curse of the Bambino, whom they regrettably traded in 1919. The book by Michael Lewis, Moneyball, detailed the inside story of Billy Beane and these amazing A's. Baseball produced yet another bestseller. And like so many such books, the story begs to be told on the silver screen. This weekend the movie adaptation of Lewis' book hit theaters across the country. I'd read the book (twice) so when I saw the marquis, with heavyweights Brad Pitt and Philip Seymour Hoffman in leading roles, it seemed a necessary way to decompress on a Friday evening. Brad Pitt is Billy Beane, general manager of a team that must win with the odds stacked against it. The book's subtitle summarizes the dilemma. "The Art of Winning an Unfair Game." Despite a stellar season in 2001, Beane's Oakland Athletics fell short of the ultimate prize and then stood helplessly by as their emerging stars were snatched up by teams with larger bankrolls. In the era of free agency this had been a perpetual problem. Beane determined that the A's, being amongst the poorest franchises in terms of money to work with, had to think outside-the-ballpark if the team ever hoped to achieve an alternate result. Philip Seymour Hoffman plays the team's old school manager Art Howe. When Beane brings in a Yale economics grad to make decisions based on numbers instead of gut instinct or a player's likableness, the teams scouts and Howe are up in arms. Beane's approach, they say, will be disruptive to the entire game of baseball. The old ways of scouting will be undermined. But Beane is determined. Howe is equally determined to be the manager and not let Beane interfere with his old school ways. Instead of playing the players Beane thinks Howe should have on the field, Howe plays the guys he believes would be more suitable. Beane trumps Howe by trading the guys who have been in the lineup instead of the players he has assembled. Ultimately, there are payoffs for this relentless commitment to the plan. When I left the theater I had a strong impression that I had just watched one of the great baseball films of all time. I can't recall a film that so clearly presents the dynamics of what goes on behind the scenes in the formation of a championship team. The story itself provides an inside perspective on a significant moment in time, because the decisions made by that one team have had ramifications throughout the major leagues. Pitt again shows his range as an actor. Billy Beane had been a superstar prospect in his youth, foregoing a Standford scholarship to jump to a career in baseball. The scouts believed him to be the next superstar, but in the end he was a failure in the big leagues and later in his marriage. Pitt's portrayal of an inwardly anguished man striving with issues of meaning in life are spot on and noteworthy. It's a fine film about a very fine story, rich with nuanced performances throughout. For anyone who has had a remote interest in baseball at some point in their lives, it comes with my highest recommendation. The question "What is art?" is certainly not going to find an answer within a lunch hour, but we'll try to open it up to something insightful for each of us to chew on. Discussions about art as as old as history and the ancient writings of Greek philosophers and the Bible tell us that art is nothing new, and debates about its role are nother new. Andre Gide's Pretexts is a collection of essays by the 1924 Nobel Prize winner for literature, with the exception of the four introductory lectures which Gide delivered in the first decade of the 20th century. The first is titled, "Concerning Influence In Literature." Gide argues that influences can enrich us, and that to the degree we restrict influences we are revealing the poverty of our own souls. A second deals with the limits of art. 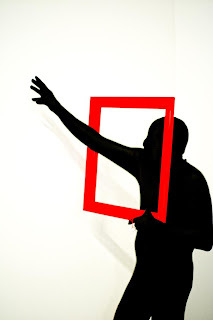 Where are the boundaries of art? Gide states that the boundaries are inside us, within the artist, not imposed. A third, and the one I wished to draw attention to was his lecture on the importance of the public. Gide saw a bad trend emerging in the arts, artists who had become unconcerned with what the public thought, who became disinterested in connecting with a public. As Goethe put it, "They behave just as if there were nobody in the theater." Gide makes his point. "It was a dangerous thing for art to separate itself from life, dangerous for both art and life." And further on, "The artist who has lost a sense of his public is not fated to stop producing but rather to produce works with no destination." Some might see Gide's comments as an overreaction to modernism in the arts, much like those who fear text messaging will destroy English grammar. And at this point it does seem the second statement is false in many instances, for a large portion of today's artists do produce works with a destination even if not for the public. Their aim is to be noticed by critics who have the power to acclaim their works as "worthy" of the label "art." And so we come full circle to the real question "what is art?" The follow up question to any answer is, "Sez who?" Keith Martin-Smith begins his essay "Art, Postmodern Criticism, and the Emerging Integral Movement" with still more questions. The question “what is art” is both more simple and more complex than it might seem at first glance. Andy Warhol once quipped, “Art is whatever you can get away with.” Is it? His observation raises some interesting questions: How does one go about judging a work of art as “good”, “bad”, or “better than” something else? What standards are used? Is something shocking, like a New York City artist who recently put vials filled with her menstrual fluids on display, art? Or is such a display really something else? As for the future of art, it's anyone's guess where things will go. 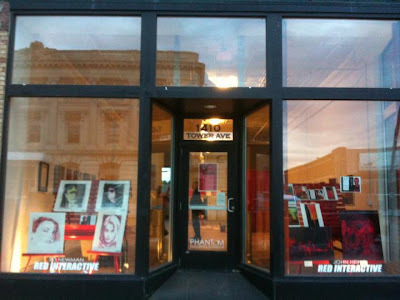 The success of shows like Ochre Ghost's Crim City Collective and the Phatom Gallery's Red Interactive hints at a possible future direction for art collaborations that feature works dictated not by a single mind but a group contribution, uncontrolled and permitted to become something no one envisioned at the outset. Perhaps not unlike the Internet, which connects us all while permitting individual expression. For what it's worth, a few Saturday afternoon seeds... sprinkled over loose soil. Add water if you wish. 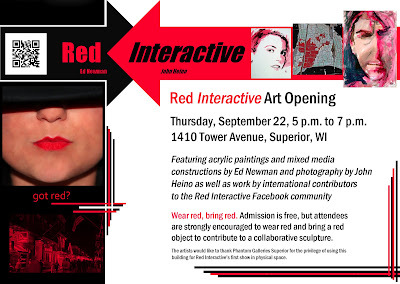 Last night was our Red Interactive Art Opening in Superior, WI. Based on the energy produced it was an invigorating experience that evoked generous quantities of smiles, creativity, appreciation and at times even awe. Red Interactive is the result of months of conceptualization and dialogue. 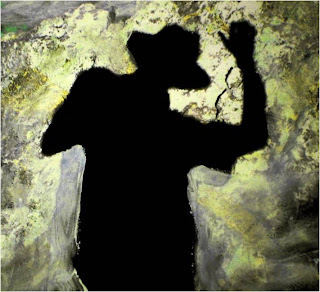 John Heino and I have frequently expressed a desire to collaborate on a project together over the past few years, but we were not sure when or how or what form it would take until we saw the initial call to artists for Phantom Galleries Superior. 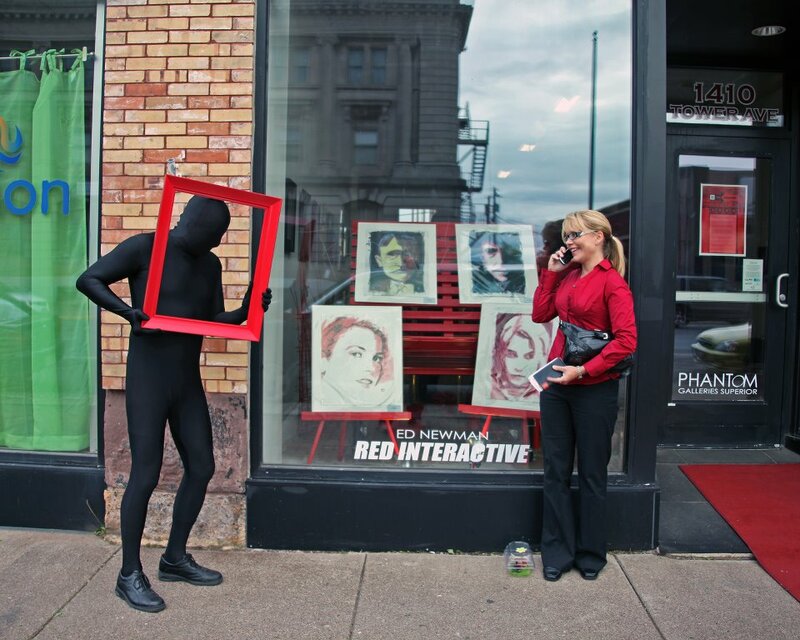 Phantom Galleries Superior (PGS) is one of six Phantom Gallery initiatives in the state of Wisconsin supported by the Wisconsin Arts Board with funds from the state of Wisconsin and the National Endowment for the Arts. PGS is a unique partnership between Superior Public Art Creating Community Environments (SPAC2ES) and Superior Business Improvement District (BID), the property owners, the artists, and the community. Use of properties is generously donated by the owners. Additional support comes from multiple artistic resources, the BID, and the Morgan Fund of the Duluth Superior Area Community Foundation. One of the challenges for John Heino and myself centered on how to communicate our ambiguous, open-ended concepts in an artists description of the project in order to gain approval to obtain a space for our show. We new our aim would be to engage a public, but the physical form this would take was undefined. An early iteration of our thoughts went like this: Our work is about perception and connection. 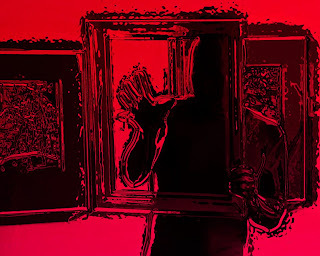 The connections are built around the various thematic meanings of Red. We were also striving through interactive social media to make universal connections involving multiple continents and cultures. 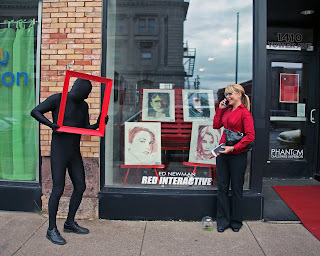 The physical component of Red Interactive aims to open in the fall of 2011 in Superior, Wisconsin (specific date and location TBA) and run for two months. At each of three events, red-themed art and found objects will be collaboratively arranged in a 3D composition within the physical space. 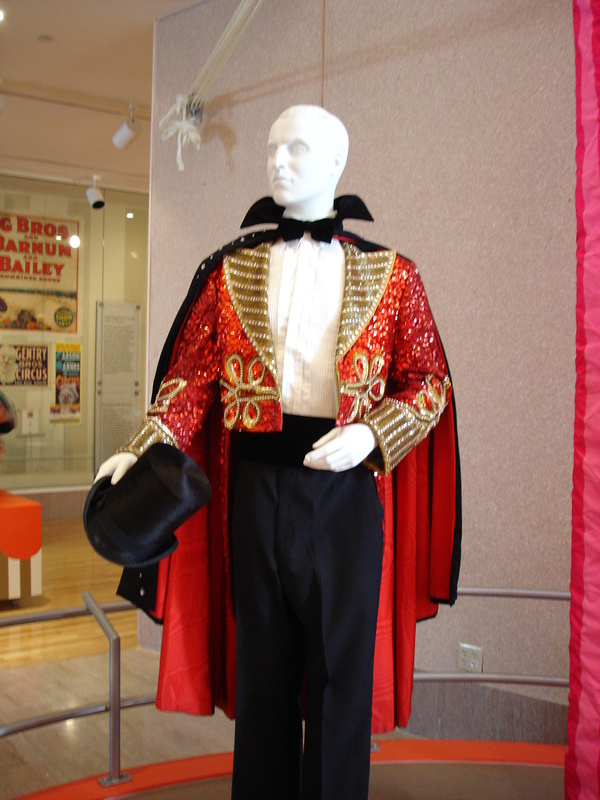 Each event will also feature red-themed performances (music, dance, poetry, etc.). 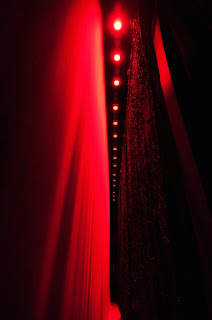 Parallel to the physical show, space and performances, Red Interactive will have a virtual space here on this Facebook page and through the full array of online channels such as Twitter and blogs. Some elements will move back and forth between physical and virtual Red Interactive spaces. This is open architecture. 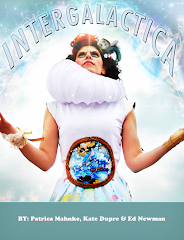 We welcome all artists, creative thinkers and people who simply enjoy art--particularly experimental projects. The only boundary is that this is a public arts project, so we ask that all physical and virtual contributions are appropriate for public display. The big thrill last night was the cross-section of visitors from all walks of life and the wildly wide range of participants in the collaborative sculpture. As imagined, the open-ended definition of what the show would be invited unexpected surprises. Jeredt Runions contributed sidewalk art directing citizens of Superior to the front door. And the surprisingly wonderful Phantom of the Gallery showed up to dazzle, amuse and delight all who were present in the early part of the evening. 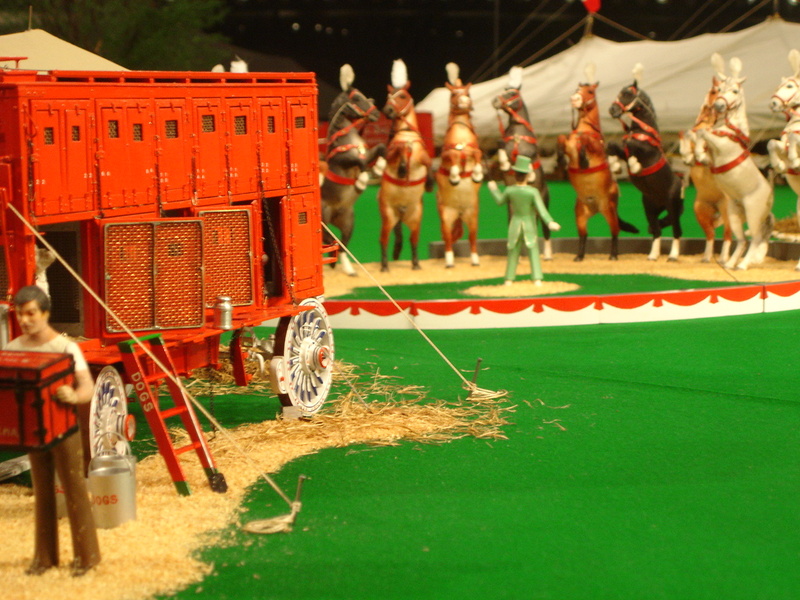 There's no business like (red) show business. Another big thrill was the involvement of artists from all seven continents in last night's show. We invited many of them to follow us on Facebook while the show was going on and two artists from Ireland texted us to say they were enjoying the building of our Red Interactive sculpture as we streamed it live onto the Internet. At the top of this page is the Art Wall of China which garnered a lot of attention. At the bottom of this page is a parting shot of the gallery after the festivities were concluded, showing the results of our red sculpture composition. Everyone had been encouraged to wear something red and to bring something red for the sculptural assembly. It came together like a dream. A huge thank you goes out to everyone who joined us last night, and to all involved in the process of making the Phantom Galleries Superior project possible, especially Erika Mock who curated our show. Two more events are planned in this space as part of Red Interactive. At some point in early-to-mid-October we will be having a Brown Bag Lunch dialogue in the space where we explore the meaning of art in our lives, the importance of public art and the role of art and artists in culture. Then, on October 20 will be a four-hour multi-gallery event as part of Phantom Galleries Superior. For more photos and commentary on last night's event visit and "Like" Red Interactive on Facebook. It started as an innocent vacation to an exotic location in a remote part of the world. Unfortunately, the location was not as innocent as it appeared, for this selfsame remote region is one of the channels by which the United States has probably slipped spies into its unfriendly enemy, Iran. The three hikers were captured and imprisoned, charged as both trespassers and spies. To say "charged" is a misnomer because it was not until 18 months later that they actually went to trial and still another seven months later before the verdict and sentencing. In the judgment of the court they were guilty, sentenced last months to an additional eight years. A lot of heartbreak went on, but if you listened closely you could hear whispers that this was Ramadan, the holy month, and acts of mercy can occur. National Public Radio interviewed linguistic anthropologist William O. Beeman regarding this situation and U.S.-Iranian relations. Beeman, a University of Minnesota professor is author of The Great Satan vs. the Mad Mullahs: How the United States and Iran Demonize Each Other. It was Beeman who noted that the hikers were probably unaware that the area they were vacationing in was also an entry point for U.S. spies. To some extent, their two-plus years of incarceration was due to our poor relations with this unfriendly state. Of Beeman's work, the Muslim World Book Review writes, "Drawing on his experience as a linguistic anthropologist, Beeman parses how political leaders have used historical references, religious associations, and the mythology of evil to inflame their own citizens against the other foreign country and proposes a way out of this dangerous debacle." We had friends who were living in Iran when the Ayatollah Kohmeini came to power. Our friends had to sell their house and all they owned in one day in order to escape into Turkey during that first night. They used their money to by a gold belt and a couple Persian rugs, which became their total life assets. The Shah himself had to flee as well. He was undoubtedly able to whisk a lot more out of the country than a belt and a couple rugs I'm sure. Two years later I was walking down a street with rich peoples' estates in Cuernavaca, Mexico, and a palatial house there is where the Shah had escaped to, the same block as one of Richard Nixon's winter homes, the same town where conquistador Cortez built his own winter palace. History is filled with connections. Sometimes innocents get swallowed by events they have little control over. Fortunately for the families of Shane and Josh, this chapter of their lives is behind them. Welcome home, travellers! See their happy faces here. Tomorrow night is our open house for Red Interactive, the international collaborative art experience John Heino and I have assembled as part of the Phantom Galleries Superior project. 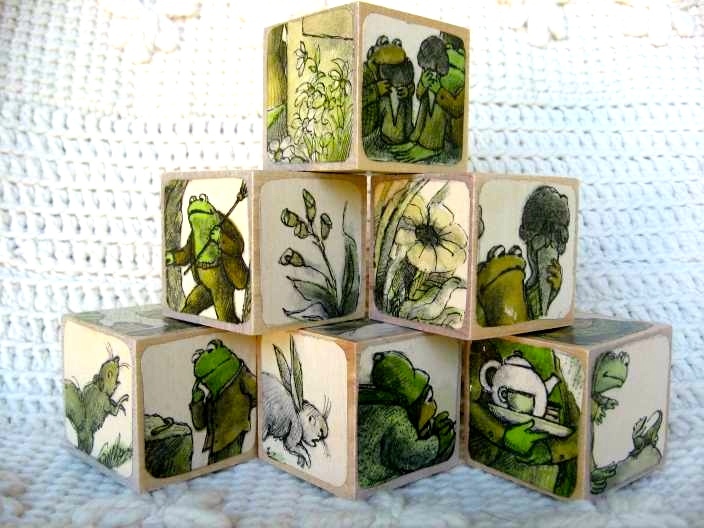 Images on this "sort of" Wordless Wednesday all tie in to the opening. Catering by the Red Mug, red-tiled floor, red-themed children's art from China, three-ring circus and the front entrance to the gallery space at 1410 Tower Avenue, Superior WI. Event begins at 5:00 p.m. We're rolling the red carpet out for you so we hope you'll join us. In my 25 years of thinking about marketing-related problems, a number of observations have impressed themselves upon me so that they have now become personal marketing principles. Among these I include the well-worn maxim, "There are no silver bullets." When you stop and think about it, virtuosity in any endeavor is the result of a hours of practice, preparation and sweat equity. Some people have natural abilities, but unless sharpened and honed the most gifted musician, athlete or sales professional will falter. Applying oneself to think from a marketing point of view is not natural to many of us. It is a skill, however, that we can learn. Unfortunately, most books on marketing are an attempt to chronicle universal truths that apply to all businesses. They do not and can not necessarily address all the particulars of our specific situations. Each of us in a different set of circumstances. Thus we must each do our own homework to think through how this principle or that applies to one's unique situation. A friend once observed that successful people do the things that are necessary, not just the things that are enjoyable. "It is interesting," he said, "that by doing these necessary things routinely and developing skills in those areas, they become enjoyable or at least not unpleasant." So it is with finding business and marketing solutions. We must invest time to think, to gather information, do our homework... and execute. This not only applies to business, but across the board in a hundred applications. A silver bullet solution will not revive a stale marriage. A silver bullet solution will not restore a broken relationship with one's children. A silver bullet will not make you rich, if you want to go there. Whereas it's true some people do win the lottery, the reality is that it does not teach us anything that we can pass on so that others can replicate our success. When you reach for the stars pay attention to where you're walking so that you don't accidentally walk off the end of the pier. I was looking at a book called Weird Words yesterday. The title caught my eye, making me curious as to what they considered a weird word. Since you may also be curious, I will throw a few out there for you. A gnomon is the part of a sundial that throws its shadow. A scut is a very short tail, like on a deer or rabbit. And sciolism is a superficial show of knowledge, maybe akin to what I'm sometimes doing in this blog. But the word that interested me most, or at least first caught my eye, was pygmalionism, a condition of falling in love with one's own creation. Pygmalion was a legendary figure from Greek mythology. According to the legend he was a sculptor who created a beautiful statue that he loved more than women. While making an offering to the goddess Venus (Aphrodite) he prayed that his statue would come to life. When he returned, he kissed it and the lips became soft, and as he touched it the ivory became a woman. What struck me about this story is how the artist became so enamored of his work that it became a form of idolatry. I know the feeling of satisfaction that comes from appreciating the work of one's own hands. How much appreciation is "rightful appreciation?" Sometimes an artist can become so enamored of the godlike power of creation that he or she imagines that everything he does is the work of a god. But it's not only artists who can become enamored of their own works. Take, for example, Donald Trump. Or a hundred others like him who build airports, rocket ships and the like. Where is the line between healthy and unhealthy appreciation? A related question, not exactly pygmalionism but a very modern facet of today's media-driven culture, is that of celebrity. Where is the line between healthy and unhealthy adulation of our superstar athletes, models, actors, musicians and the like? How do we know when we've gotten out-of-whack? Just some pondering that took place last night. Time now to start another week. For Minnesota Twins fans this will not be a season to remember. At a dismal 28 games out of first place in their division it's almost a sure thing that they will take a solid stand in the cellar as the season winds down. A central issue has been the problematic health of their wonder boy Joe Mauer whose injury-plagued year has received as much press as any Twins achievements. (Yes, they did have a win streak at one point.) This weekend Joe Mauer was diagnosed with pneumonia and will likely be done for the season. Mauer's pneumonia brought to mind my own experience with the disease when I was a young baseball player. I was in seventh grade at the time so it must have been 1964. I played shortstop for the Pluckemin Little League team. Like Joe Mauer I loved playing baseball, and like Mauer I was pretty good at it. I was one of two players on that Pluckemin team to get picked for the All-Star Game. Then the hand of fate intervened. I was struck down with pneumonia. Pneumonia is a respiratory disease with a track record of having killed a lot of people throughout history. Before the advent of antibiotics it was nicknamed "the old man's friend" because it was the last disease older folks got before they passed on. In the Third World it still remains the leading cause of death among the very old and very young. It's essentially an infection of the lungs. The symptoms are supposedly cough, chest pain and fever, among other things. But honestly I do not recall any symptoms at all, though there must have been something that caused my mother to bring me to the doctor who provided that verdict. The cure is simple: take your meds and rest. For Joe Mauer this means he can't play baseball. He can't work out. He can't run around. He has to rest. And for me, being a seventh grade boy with an overabundance of energy, the "rest" part was not an easy prescription to follow. I didn't feel ill. I wanted to play in the woods. I wanted to play baseball. And even though I could not go play ball, my mother frequently found me in the woods behind our house. After discussing this situation with the doctor it was decided I should be hospitalized. I spent five days in the Somerset County Hospital during which time I had many interesting experiences. The first room I stayed in was next to the operating room. One morning I watched the nurses roll a body out of the operating room with their skull still open wide after a surgery. The blanket covering the person had not been pulled fully over the head, the face being turned away from my door. When I commented on this to my mother she mentioned it to the doctors who said this was not possible and I was imagining things. Needless to say I was moved out of that room the next day and up to another floor. The big event of the week, though, was the Little League All-Star Game. I was supposed to be the starting shortstop, but here I was in a hospital bed. And it was here that I received the news that the kid who replaced me hit a grand slam home run in my place. The pitcher was an intimidating fastballer from Far Hills whom I had found challenging, and I've often wondered how it would have affected my self-esteem had I struck out with the bases loaded that day. Joe Mauer will be sitting on the sidelines as he watches the slumping Twins limp toward the end of the season. That is, unless he doesn't rest like he's supposed to. Then he will be watching those games from a hospital room, because his mom most assuredly wants him to get well soon. To start, it seems wrong to me that after three days of heavy frost I still find a mosquito pestering me in my office. Didn't he get the memo? Mosquito season as over. Kaput. Done. There were a couple big events this week. The first was the launch of my debut novel, The Red Scorpion. TJ Lind (my collaborator) and I originally intended only an eBook for Kindle and Nook, but as the day approached for our launch party the requests for hard copy versions of the novel began to weigh on me so that in the end we broke from our original plan and actually had a short run printed for the occasion. Being both of a marketing frame of mind, we used the fifty copies to do some market research. Inasmuch as we had two cover versions that we liked and couldn't quite decide on, we printed 25 of each and let the market make the decision. We did learn something from the experience. The second big event this week was making contact with an artist from Antarctica for the collaborative art show Red Interactive. John Jacobsen works in the technical arena but also has an artistic/creative expressive side to his soul. Over the past five or six years he has spent much of his life in that remote ice wilderness and has graciously permitted us to include one of his "red" photos in the show Phantom Galleries Superior in September/October. 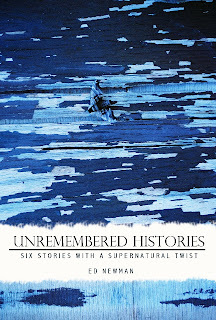 As regards the book publishing side of things, TJ and I are working together on the final edits of my first volume of short stories titled Unremembered Histories. Official launch date is as yet unspecified, but aim is sometime in September. The story lines for the six short stories in this first volume are as follows. A brilliant German scientist in the Nazi era has been working on the superbomb which will bring the world to its knees before Hitler. Upon discovering the secret of atomic power, he commits himself to two tasks. First, to thwart the efforts of the team working on the bomb. Second, to find a way to convey the solution to the American scientists working on this same problem. What happens when you have an experience so bizarre and out of the ordinary that you don't know who you can talk to about it without coming across as looney? In this story, I hear a man's confession, and whether true or no I feel compelled to listen and express empathy. This story has been translated into Croatian to become the centerpiece of an online poetry site in Croatia. A great poet discovers he is no longer the only game in town. Like many of my stories, this story evolved from a dream. It's about a lonely man who discovers a life changing secret. I have no words or intellectual connections for this story for I find it truly original and very special... it reveals to me what an incredible good person you must be to dream of a world with no wars and a generation of "Angels" to protect us all from evil. Yes, that would have been wonderful and surely by imagining it you must have felt it could have been possible if only Man were different and had not bitten the Apple of the Tree of Knowledge of Good and Evil in Paradise... the story takes back me to that point where it is said we lost our innocence and from then on lived in shame due to our curiosity and disrespect for the Sacred orders of God. If Adam and Eve had not broken the Law we would live still in Paradise and that would be very much like what you describe on your story... it is a beautiful story that makes us - readers - be the "change we want to see in the world" and don't give into temptations every time we encounter a Serpent telling us that there are shortcuts to Freedom/Happiness/Harmony because as you so well say in the story - it all has to do with "INTENT" (purpose) for that's the root of the outcome of any endeavour we take.. 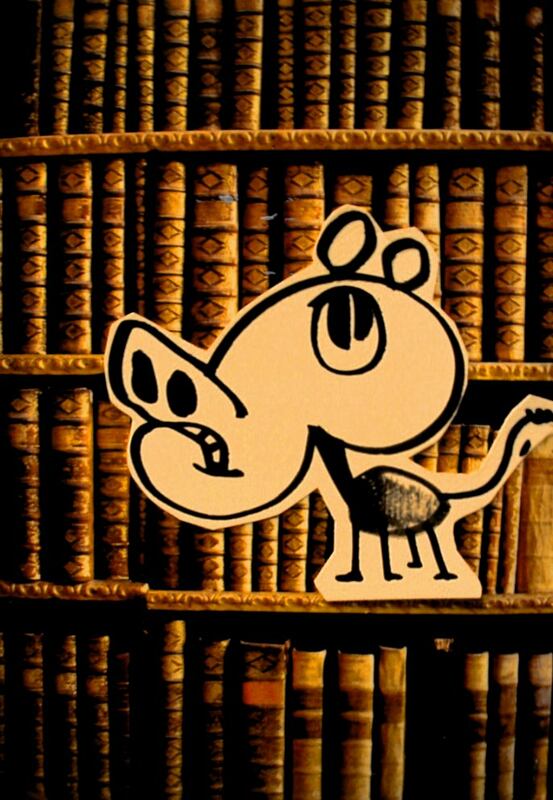 This story owes a debt to Jorge Luis Borges and a profound short story of his titled The Book of Sand. I can't say enough about how Borges' works moved me. 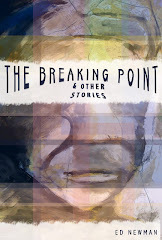 Like the rest of the stories here in this short collection there is a paranormal element that confronts the characters, and ultimately the readers, challenging perception and our understanding of the material world we inhabit. Lord willing, Unremembered Histories is coming soon... 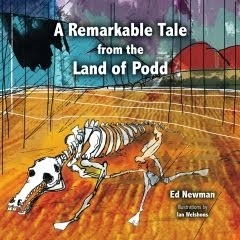 In the meantime, check out the reviews for The Red Scorpion at Amazon.com. And have a great weekend. Cherish the people you love and who love you... and never take tomorrow for granted. 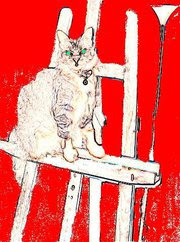 The painting of the cat is courtesy Biba Zain, who is participating in Red Interactive this month. Twitter is probably one of the least understood of the social media communities, though it's actually quite powerful for reaching a lot of people in a variety of ways. It's also a fascinating tool for people watching, and for those looking for cheap entertainment, Twitter offers up plenty of that. One way is by digging into the Trending Topics. Trending Topics was an algorithm created by Twitter designed to identify hot topics of the moment. To the right of your Twitter-feed you will find what's hot, what people are talking about. A lot of times the trends are driven by celebrity culture. For example, today Tom Brady is a trending topic in the Minneapolis area. Other times big news stories will dictate a lot of the buzz, such as the incident in Oslo or the fighting in Gaza. More often than not there are simply a lot of fun comments being passed along the Twittersphere by people who enjoy interacting with others and expressing themselves. A few of those today include Vampires vs Zombies, #FastFoodAddiction, #UKnowUHungryWhen and #kindofabigdeal. For the fun of it I will share a few of the excerpts from trending topics called #AnnoyingThingsPeopleSay and #IfTwitterWereHighSchool. ~ "There are no stupid questions." Oh yes there are! come here i have to tell you something.............. ahh nevermind. ~ " i misss you. " and do absolutely nothing to try to see you or talk to you. uhh , NO. you clearly don't. ~ "ur so small, do you eat?" .. "no im alive from just breathin air -__-." ~ "I have to tell you something" ..."ok tell me"... "I'll tell you later"
~ "whoa you're short." thanks! i never knew! Then we have the comments on the another of today's trending topics... which reveal a little about Twitter as a community. And it would make great fodder for Mad magazine material. Or writers for Leno, Letterman and the like. ~ trending topics would be the school gossip. ~ one person would do the homework and everyone else would just Retweet it. ~ there would be sooooo many people in Remedial English class. ~ the most popular lastname wouldn't be "Smith"... it would be "Bieber"
~ I'd actually have friends. ~ I would have perfect attendance. Well... you get the picture. It's time for me to post this and get on over to the Middle school. It's officially here. Today's the day of our book launch party. As is customary, I woke early again to scribble a few more notes to myself. "Don't forget Kindle. Bring more folding chairs. Extension cord. Bag of ice." A friend called last night to say he couldn't find much information about my book on this blog and I realized that in my effort to not devote all my blog space to promoting my book launch I have been underplaying it. Forgive me if you haven't heard. Facebook "friends" are aware. A link to our Facebook page is at the end of this column. For what it's worth, if you're just finding out about it the launch party tonight is from 7:00 - 9:00 p.m. at Goin' Postal, on the 800 block of Tower Avenue in Superior, WI. I chose the venue because of an art connection with owner/photographer Andrew Perfetti who has graciously allowed my paintings to be displayed in his space the past ten months. For one night only every painting and drawing will be available at negotiated prices in an effort to raise funds for further promotion of The Red Scorpion. I've been reading that it is important to tell people you are having food so that more will come. So, there will be pizza from Thirsty Pagan. We're cutting it into half in squares so that everyone can have more than one piece. My partner in this venture is TJ Lind, a high school student from Proctor with whom I have formed a publishing company called N&L Publishing. When we first laid out our plans two months ago we'd decided to go strictly with ePublishing on Nook and Kindle. We planned at the time to give a dollar bill to everyone who had downloaded a copy of the book and came to the party. 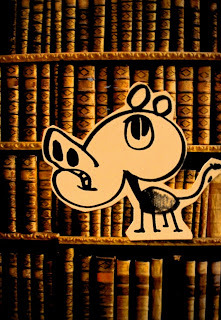 Well, that plan has changed because for some crazy reason we decided to print a small quantity of non-virtual books, old-fashioned as that sounds. We're still sticking to our original plan, however, and will be giving away dollar bills to everyone who buys a book tonight. Something to remember us by. A special feature of tonight's book launch will be the market research we're conducting. We have two versions of the book cover and have not yet settled the matter as regards which to go with if we print more books. The version we're currently leaning toward does not translate well into black and white, which is the only way to view it on a Kindle. The color Nook looks sharp, for sure, but how many people do you know right now with a color Nook. As for the book itself, my target was to write a book that would be a fun read for teenage boys. I asked myself what kind of book would I like to read and I did my best to write that book. I personally like a story that moves you along. I like clearly defined characters. I dislike tedium, which is often what I find in 1,000 page volumes in which the author tells you the history of wood in order to set up the kind of door that was built to conceal the secret in this closet. Michener began his book Hawaii with thirty pages describing waves. That may be for you but not for me. At least, not until I find myself abandoned on an island somewhere and that's the only book that washed ashore with me. So, if you can make it, we'll see you tonight. We only printed a limited run for this occasion, but it seems like we may have to get into more serious discussions about a second batch. I'll keep you posted. The best way to stay in the loop is to follow us on Facebook. Click "Like" and you're in the game. See you tonight. As anyone who knows the story knows even half-well knows, a very young Minnesotan, the former Robert Zimmerman, followed his dream and arrived on the doorstep of the the Big City at the dawn of the 60's. Performing in places like the Cavern and other Greenwich Village hotspots, he blew his lungs out on a harmonica -- a dollar a day's worth -- and sang folk songs rooted steeped in tradition. Striving at first to emulate his hero Woody Guthrie, he sounded far more mature than his years. As Frank Sinatra once sang about this experience, "If I can make it there, I can make it anywhere... New York, New York." Well, the newswires have been lit up by another side of Bob Dylan which is emerging here in New York once again. That is Bob Dylan the artist, as in painting. The works will be on display at the Gagosian Gallery on the Upper East Side from September 20 to October 22. How to read Kindle books on various devices. We're live. 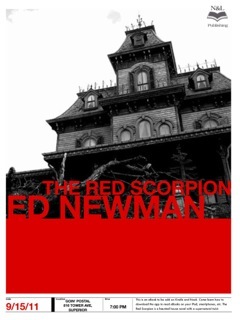 The Red Scorpion is now available on Amazon.com. Here's the page where you can find it. Tada! You are set to start reading ebooks on your iOS device! Due to Apple regulations, you cannot buy eBooks from within the Kindle app. You need to go to www.amazon.com/kindle to purchase books. The process of downloading the Kindle application on Android mobile phones and tablets is virtually the same as for iOS. Open the Android Market and search for Kindle by “AMZN Mobile LLC” and follow the instructions to download the application. When you open the app the same will happen as with the iOS version. Open your web browser and navigate to www.kindle.com. Scroll down a bit until the heading “Buy once read everywhere.” From here click on either Mac or PC to get to the download page. Follow the onscreen instructions and you are ready to go. Amazon also offers a cloud reader where you can read books within your web browser. When at The Red Scorpion page, or any Kindle page, look for the small text Cloud Reader in the white Kindle Store menu bar at the top of the page. It's right next to Buy A Kindle. Currently, the app is designed for the Chrome and Safari browsers. Currently the book is listed at #18,374 among Amazon Kindle bestsellers, so we have a little climbing to do to reach the top of the charts. In the meantime, have a great week, starting today. And if you're in the neighborhood stop in at our launch party, 7:00-9:00 p.m. Thursday September 15 at Goin' Postal in Superior. When able, I like to orchestrate my Saturday evenings around a few programs on the local public radio station KUMD. Highway 61 Revisited is John Bushey's weekly Dylan-fest of rare cuts from concerts or themed interweavings of Dylan songs and covers of Dylan's work by other artists. Whenever possible I like to be painting in my studio during this program. After the Dylan hour is a four hour stretch called Folk Migrations which is simply a gift. There is so much great music out there and you just don't hear it on the mainstream stations which dish up a lot of the same tripe year in and year out. Last night on Folk Migrations I heard a wonderful version of You Were On My Mind by the original artists Ian and Sylvia. The strum of the acoustic guitar on this original version of the song is really dynamic and pulled me in. The guitar/autoharp interplay is especially rich. And it quickly sent me to my office so I could find it and listen once again on YouTube. The lyrics were a little different from the version popularized by the group We Five, which I also loved way back when. Ian and Sylvia's version expresses pain, talks about going to the corner and getting drunk and sick to deal with the pain and finally decides in the end that it's time to move on. The We Five version is a cheerful, energizing folk/rock anthem with a wholly other sound. Even though they sing of troubles and wounds to bind, you get a completely different feeling. It reminds me of what Cirkle did to Paul Simon's Red Rubber Ball, another song about pain and loss that is transformed into an upbeat hippie-era la-dee-da pop chart success. It was fun watching Beverly Blivens in her white mid-calf boots, dancing and singing and getting into it. The We Five harmonies are wonderful and the recording they made was tight, nicely assembled, building to a proper crescendo of energy and then pulling back for that soft landing. Really special. Truthfully, I love both versions of the song. If you go to YouTube you can read all kinds of debates about why this version or that is better. Well, each has a place and it was fun last night escaping for a short space of time into some of the good music of the Sixties. And when I woke up this morning, some of that good music was still on my mind. Thank you, Ian & Sylvia, We Five and all the other musicians who contributed to the Sixties experience. Have a wonderful day... Let music carry you through. While getting a hair cut yesterday I was leafing through a Duluth-Superior Magazine that caught my eye. A feature story was the ranking of the best eating places, the best atmosphere, best breakfast, best brunch, best appetizers, best dinner, best steak, best dessert... you get the idea. But the mag didn't stop with eating places. There things like the best scenic view, best scenic drive, and one was the best art gallery. The article listed not only the best but also the second place as well. No doubt this would help defray any hard feelings from advertisers who were pretty good but not best. 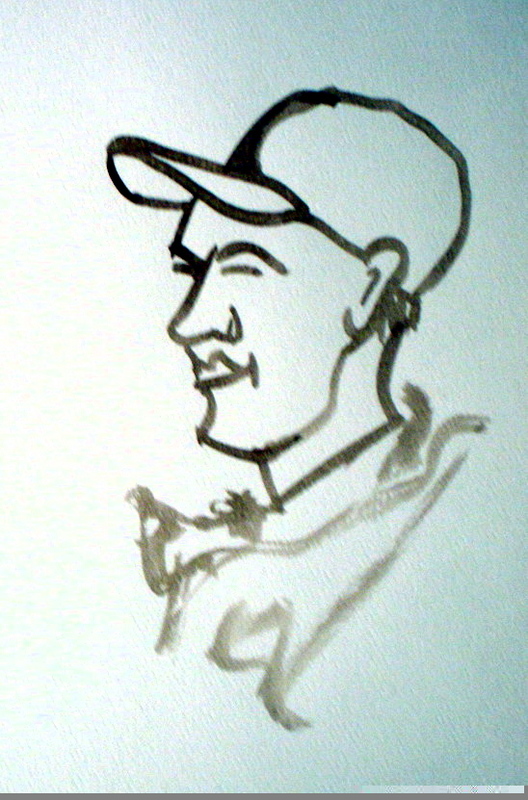 Interestingly enough, the best gallerier -- first and runner-up -- were Ochre Ghost, where I had had my Dylan pieces displayed during Dylan Days, and Lizzard's where I have three pieces and was heading to later that day to pick up "Man Wearing A Red Smirk" for the Red Interactive show coming soon to Phantom Galleries Superior. Jessica L has done a fabulous job of putting Ochre Ghost on the map with original works by risk-taking artists. Last night I attended the opening of Risk of Dying is Greater in the Northland: new work by Avery Cassar plus the CD Release of Danecdote's new album: Mise en Place. The small space at 22 Second Avenue East was fairly alive with energy from the music and the enthusiasm of the artist. The photos on this page are from last night.